I was privileged to be invited to participate in the planning phase of the Frankfort Germany Zoological Societies (FZS) international gathering to write a Master Plan for the recovery of the war ravaged National Parks. All proceedings, written and verbal, were in French in this largest Francophone country in the world. The Parks cover more than 12,000 square miles and are hot spots for biodiversity and new species discovery. The FZS has a long and distinguished history of important work in Africa and my paths have crossed with theirs for much of my life. I feel a personal association with this effort because their famous president for 40 years, Bernard Grizmek, became a friend when he was one of our clients at our home and business, the Kachemak Bay Wilderness Lodge and at our Chenik Brown Bear Photography Camp years ago. In the words of Australian James Wolfensen, twice head of the World Bank, “the wave of the future is toward developing countries” and, “the development of human capital in the form of education and health care in these places is critical.” While the attention of the euro centric world is largely focused on the Middle East and China, it is countries like the Congo that are among the sleeping giants. It is the l9th most populous nation on earth, the 4th most populous in Africa with 70 million people and more people speak French here than in France or anywhere else on earth. The U.S. has had strategic interests in the Congo for decades because of rare earth resources critical to computers, not to mention vast reserves of gold, diamonds, and copper. Some estimates say that there are $24 trillion in these resources yet buried. We were the vanguard in the creation of that plan subsidized by a 3 million euro European Union (EU) grant. In these blogs you will come with me to visit the remote Parks as we take the results of the meetings into the field for application. My roots in Africa are deep, as are all our roots, drawn from that ancient soil. In saying that “god is from Africa” Carl Jung referred to this ancient evolutionary connection. I bring to this engagement a set of African experiences that may prove useful to those engaged with trying to restore these Parks. When my children were 5 and 7 years old in l978 we traveled to Timbavati in S. Africa on the border of the Kruger Park Wilderness where we lived for awhile in a very remote lion research camp while visiting Chris and Charlotte McBride. They had just published The White Lions of Timbavati. Ours became a life bond. Chris and Charlotte wrote two more books about their lives with lions. This significant conservation success, highlighted in the Africa Geographic magazine precipitated other conservation-oriented trips and now I am back again and working to involve Bateleurs in the Congo. With my Zulu friend M’Vuzee in the Umfoloze Wilderness taken a few years ago when I was given a plane ticket to Johannesburg to dedicate a building for the Bateleurs, “Volunteer Pilots Flying for Conservation in Africa.” I am one of the founders of this NGO. A weary pilot who looks a lot like me after flying the African bush taking a break on a grass strip in Pondoland, the “Wild Coast” where I flew a Bateleurs mission to document the incursion of mining activity on a UN World Heritage Site, called in Zulu, I’simangaliso or St Lucia Wetlands. It was while we were fighting to protect and preserve this world treasure that I helped my African friends “clone” America’s Environmental Air Force, Lighthawk, in Africa as the Bateleurs. There are now over one hundred pilots flying for conservation under the Bateleur’s banner. 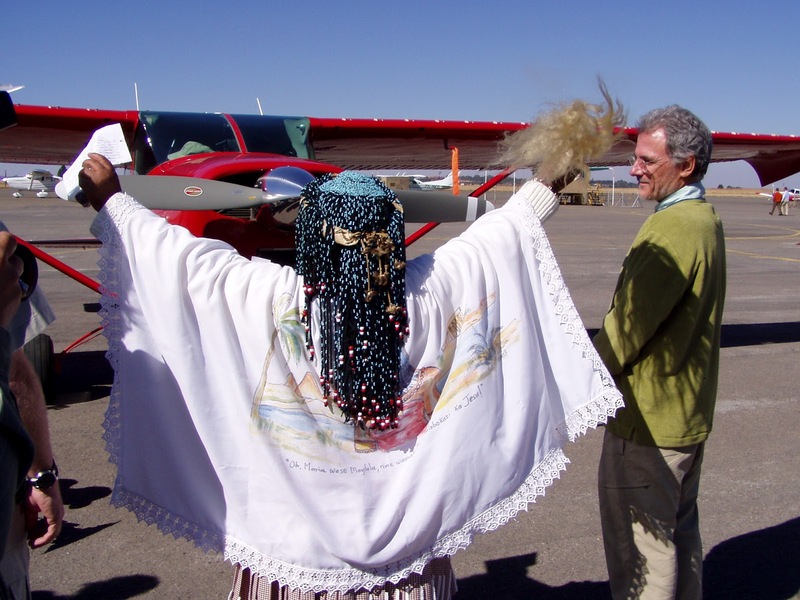 Michael Fey, a National Geographic Explorer-in-Residence and his Cessna get a sacred blessing from a “sangoma” as he prepares to fly a Mega-Transect mission to retrace and document his famous walk across the continent, which resulted in the creation of a National Park and called world attention to the plight of elephants in this part of Africa and increased their protection. Nora Kreher, beloved Founder of The Bateleurs was as gracious to me as any sister could be. In this series of African Congo blogs, I will wear the hat of a Wilderness Foundation board member. I will represent their interests and history in the arena of International Trans Boundary Parks. The Wilderness Foundation has a long and successful history of action to create animal migration corridors; in this case we are concerned with elephant migration paths between the Parks.